Fortium is a modern and well-working PrestaShop theme, which is compatible with all major browsers, ranging from IE 8, IE9 and Opera to Chrome, Firefox and Safari, which means that once having your online shop site created you do not need to change its appearance no matter what browser or device it is viewed on. So, in addition, it supports 1280px+ Wide screens, 960px+ laptop screens, iPad or table horizontal, iPad or table portrait, 479px+ Mobile devices, iPhone, Android, Windows phone and other smart phones. Moreover the theme has unlimited possibilities. One of its many advantages comes from the fact that the theme is based on a 16-column grid, which possesses 6 px baseline grid with 6 products per row. Furthermore the installation of the theme is extremely easy and no matter if you are a beginner or an advanced user of web technologies you can cope with this user-friendly template. What’s more, when speaking of installation, it becomes so easy due to the installation wizard and again thanks to it you can choose among the numerous colour variations. Additionally the theme is SEO-friendly with complete semantic markup having SEO in mind. The theme itself offers single and multi column support; furthermore it possesses Flexslider static block and further customizable static blocks. The custom navigation of the theme is usable not only on personal-computer screens but on mobile gadgets as well. The further options strike the users and their customers as extremely handy and essential; among them are: the grid or list view option, the chance to customize your footer blocks as well as the opportunity for newsletter integration so that clients could subscribe and receive news about the latest goods and products directly on their e-mails. 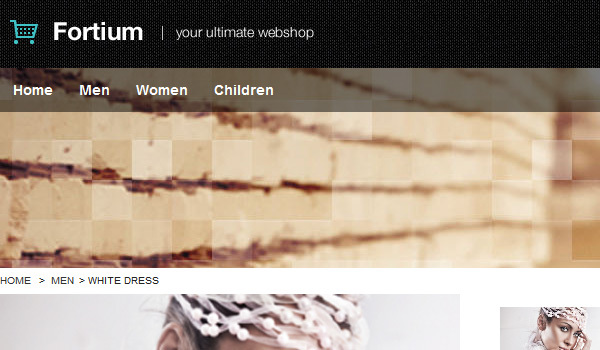 Finally the dynamic skeleton grid makes the Fortium theme one of the best templates for online shop sites, which on top of that impresses customers immensely.